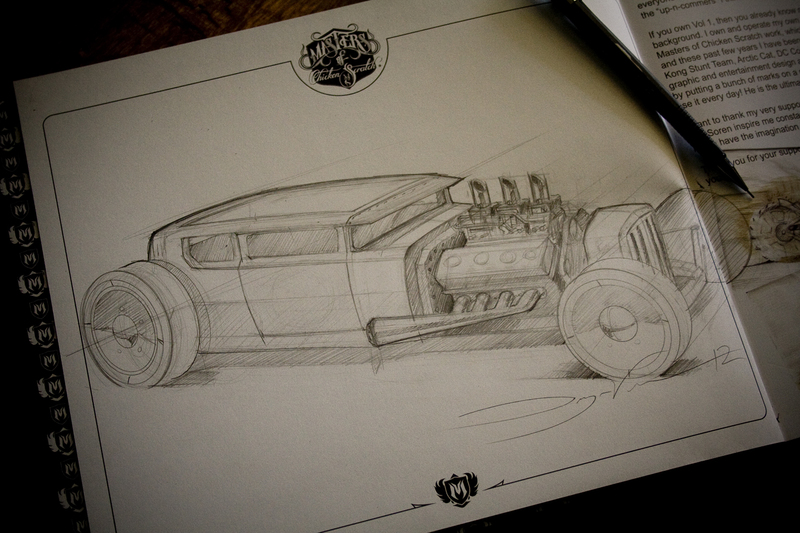 Here is part 2 of my hot rod sketch in the Masters of Chicken Scratch Vol 2. I finish the process of walking you through my sketch process. I cover a several topics as I am drawing. Some of the stuff I cover are different sketching styles and how I combine them when I draw.I use a designer style sketch when I layout my drawing but later go to more of an illustration style sketch by the end of the drawing. I explain it more in detail in the video. I finally figure out the front grill area after man attempts and the final sketch looks great. If you have any questions please feel free to ask in the comments section below. If you did not see part 1 make sure to watch that first. More tutorials coming up soon. First Off, I wanted to say that I just received Vol.2 of your book last week and it’s simply Amazing!! I really like the little Thank You Card that came with the book that you Autographed…It’s a great personal touch and very cool. As for the video, your comments and tips are extremely helpful and I’m learning a lot after watching your videos. You do a wonderful job at explaining your process and it’s cool that you take time out to post these videos to help others. Is there any chance in the near future you could do a video on a “Traditional Custom Car” design like the 52 Chevy or Shoebox Ford you did in the past?? It would be nice to see your process on a custom, but I still love your Hot Rod designs too!! Keep up the Great Work Dwayne and I look forward to your future posts. Thank you Cameron and I will see what I can do about your “Custom” request. I did just finish up a funny car and a muscle car. I have a 67 Pontiac Bonneville so maybe I will play with that and make it into a custom.